You haven’t been christened a new mom until you have had to change your baby on the floor of a bathroom, in the trunk of your hatch back or on a public bench. Sadly, so many restaurants and stores still lack changing tables and even the ones that do have them often leave something to be desired and require a cover. Most diaper bags come with a change mat, but it is often or in your diaper bag – which you may or may not have actually brought with you on your quick trip to the store or walk to the mailbox. A number of companies have wised up to this issue and brought out handy little changing wallets or clutches that have a mat in them for quick on-the-go diaper changes. 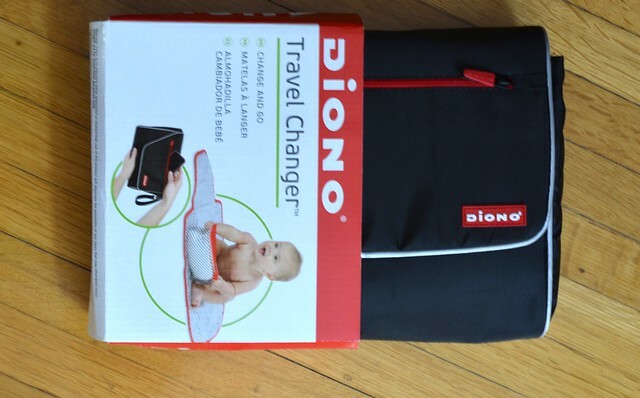 Diono, most well known for their fantastic car seats, has come out with the Travel Changer™ and it doesn’t disappoint. 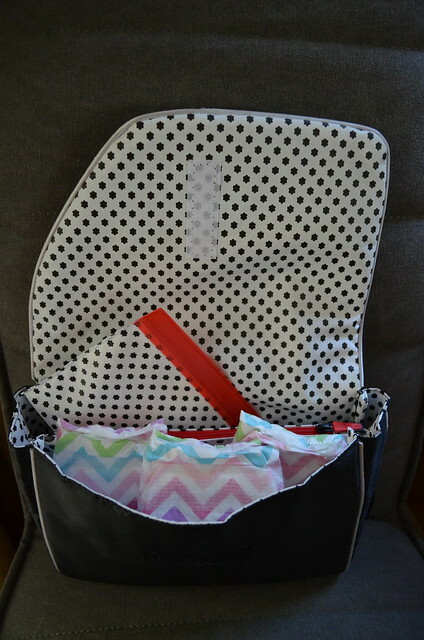 Unlike many of the other clutches I have seen, the Diono has plenty of space for diapers and other essentials as well as a very generous changing mat. What really set this one apart for me is that is also includes a ziplock-style re-useable wipes holder. Being able to actually put all the items you need for a quick change in one compact changer is incredibly convenient. The Travel Changer™ has a mat that is quite plush and washable, which is also critical. It isn’t the biggest change pad I have ever seen, but baby E is pretty much as tall as they get. At 5 months she fit very comfortably on it and I suspect will for another 6 months or so. After that she would probably just have her legs coming off over the end, which is also fine since it’s really her head and bum that I would need to have protected. The exterior pocket makes this an all-in-one product in that you can toss your cell phone and keys in there and just grab and go. There is also a zippered divider inside the changer, which could be used to store baby essentials like cream or even a credit card and some cash for a shopping outing. I also liked that this product is quite sporty looking and not overly feminine so that my husband can easily take it with him for a short trip to the store without complaining endlessly that it looks too “girly”. Anything to get the husband to change diapers right? With a detachable wrist strap, this can easily be attached to the side of your stroller, which is exactly where I intend to keep it. It would also be the perfect thing to keep in the car in the horrifying event that you leave the house without your diaper bag or diapers. Been there, done that. The Diono Travel Changer™ retails for $24.99 and will be available soon at select retailers. This would make a fantastic shower gift or gift for somebody who seems to have everything already. Where is the worst or most awkward place you have ever had to change your baby? Jen Shragge is a yoga instructor and all around eco-diva. She now lives back in her hometown of Toronto after ten years in the Vancouver area. Jen’s days are filled by her seven year old son and husband plus her toddler who was crazy enough to make her arrival on Christmas Day. In her spare time, (do moms really have spare time!?) Jen is a stylist for Peekaboo Beans, a play-focused quality children's clothing line. This is so handy! 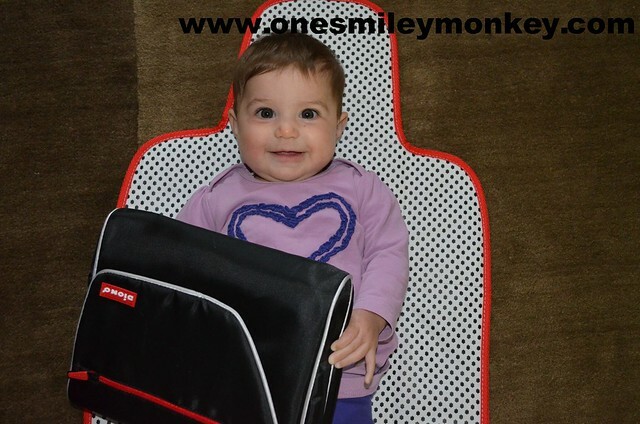 And I wasn’t aware Diono made anything beyond car seats….thanks for sharing! I never had one of these with my first baby, but it would be so handy on trips! i have never heard tell of these before , what an awesome idea tho , thanks for sharing our awesome review , i will be looking for one for my new Grand Daughter arriving next month ! That sounds like it will come in handy! I think we had to do a diaper change on a picnic table once. That looks super handy. I like that there’s no public germs when you have your own change pad. I love this Diono Changer and I agree with you that it would make a wonderful and useful baby and or baby shower gift. I did not travel much when my babies were small. My husband was a busy farmer and I did not learn to drive until I was 39. It was a different world them. Most moms stayed home.